In two years’ time, the four successful technology trade fairs GIFA, METEC, THERMPROCESS and NEWCAST are being held in Düsseldorf again. From 25. to 29. June 2019, everything will be revolving around foundry technology, metallurgy, thermo process technology and castings in Halls 3 to 5 and 9 to 17 on the exhibition site. GIFA, METEC, THERMPROCESS and NEWCAST are separate trade fairs that stand in each case for themselves and their markets. They only present a complete picture of the “Bright World of Metals” together, however. The range presented at GIFA covers the entire market for foundry plants and equipment, die-casting machines and melting operations. The major plant manufacturers are a key feature of METEC, which is already taking place for the tenth time in 2019. Exhibitors there are in particular suppliers of plant and equipment for iron making, steel making and non-ferrous metal production and for casting and pouring molten steel as well as rolling and steel mills. Industrial furnaces, industrial heat treatment plants and thermal processes are the main emphases at THERMPROCESS, while the 5th NEWCAST concentrates on the presentation of castings. The four trade fairs will be complemented by an extensive programme of additional events (including congresses), which has been compiled to satisfy the requirements of the entire industry and will be combining theory and practice in an ideal way. The “World Foundrymen Organization“ (www.thewfo.com) will, for example, be holding the WFO Technical Forum – the international conference for the process technology industry – at GIFA again. The GIFA Conference, the special show organised by the National Association of the German Foundry Industry/BDG (www.bdguss.de), is another established point on the agenda that has already been arranged. 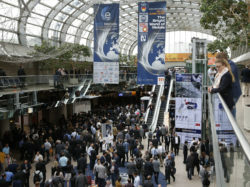 ESTAD, the “European Steel Technology and Application Days“, (www.metec-estad2019.com) – organised by the VDEh Steel Institute in co-operation with Messe Düsseldorf – is a major feature of METEC 2019. The five-day ESTAD already begins on 24. June, i.e. the day before METEC starts. The topics that are being covered there include not only the central “Industry 4.0” issue but also above all the latest technologies for steel and iron production, surface treatment and additive manufacturing technologies as well as energy and environmental subjects. Another important event at METEC is the EMC – “European Metallurgical Conference“, which the German Society of Metallurgists and Miners/GDMB (www.emc.gdmb.de) is already organising for the 10th time at the forthcoming METEC – from 23. to 26. June 2019. Demand for European metallurgy and foundry technology is very strong in Asia particularly. Theory and practice go hand in hand at the two THERMPROCESS events too – the FOGI Special Show organised by VDMA Forschungsgemeinschaft Industrieofenbau e.V. and the THERMPROCESS Symposium organised by VDMA Metallurgy. NEWCAST, which is taking place for the fifth time in 2019, is also providing the professionals from all over the world two major platforms for know-how transfer and networking: the NEWCAST FORUM organised by the Association of German Foundrymen/VDG (www.vdg.de) and the NEWCAST Award. This award for outstanding achievements in the castings field has been presented to industry players ever since NEWCAST premiered in 2003. The four trade fairs produced exceptionally good results when they were held most recently two years ago: 78,000 visitors from more than 120 different countries came to Düsseldorf for GIFA, METEC, THERMPROCESS and NEWCAST from 16. to 20. June 2015 to experience what the 2,214 exhibitors had to offer. The atmosphere in the halls was excellent: the trade visitors were extremely impressed by the presentation of complete plants and machines and placed numerous orders. The trade fairs were once again considerably more international than at the previous event, with 56 per cent of the visitors and 51 per cent of the exhibitors coming from outside Germany. Portfolio Director Friedrich-Georg Kehrer and his experienced trade fair team will continue to be responsible for these four trade fairs – as well as for wire and Tube and the international offshoots. All in all, the “metals and flow technologies” portfolio consists of about 30 Messe Düsseldorf Group events around the world. The ones that take place at the Düsseldorf location – apart from the four outlined above (GIFA, METEC, THERMPROCESS and NEWCAST) – are wire and Tube (from 16. to 20. April 2018), VALVE WORLD EXPO and the Pump Summit (27. to 29. November 2018) and the International Thermprocess Summit ITPS (27 to 28. June 2017). Kehrer explains: “Messe Düsseldorf’s global focus led last year to the organisational concentration of all the events held by Messe Düsseldorf around the world, including the leading trade fairs that take place in Düsseldorf. Since all 30 trade fairs are now part of the same portfolio, we can exploit the synergy benefits and the team’s know-how more effectively”.